In this post, we’ll take a look at the top nine tips for writing secure applications in ASP.NET. Security is one of the most important aspects of any application – and when we talk about security, particularly in ASP.NET applications, it is not limited to development. A secure app involves multiple layers of security in the configuration, framework, web server, database server, and more. In this post, we’ll take a look at the top nine tips for writing secure applications in ASP.NET. But this is very risky because here we not validating the complete request. Say the model has twenty properties, all will be exempt from the validation while we might need to allow html in only one or a few controls. Now we can use tags for the name only. CSRF (also known as one click attack) is a type of malicious attack where unauthorized commands are fired from a trusted website where the user is authenticated. In real world scenario, say the user logged into an application with windows/cookie based authentication. Now without logging out, the user visits a malicious site and clicks on a button. The external website initiates a request via your website for doing an unethical operation. It will be considered as valid request because the request is authenticated. While submitting the form both of the tokens (cookie and hidden field) are sent to the server. Both are validated at the server, and if either one is not present or tampered then the request is not allowed. But see how much information it is showing to outside world: internal code, physical file structure, stack trace, and the version of ASP.NET and .NET framework. 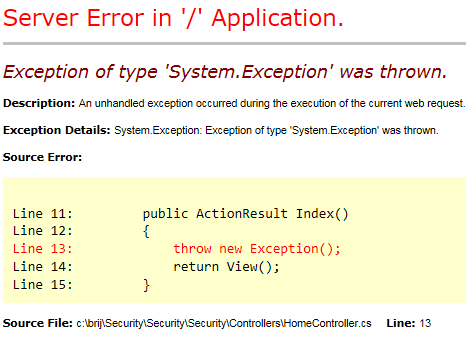 This will show an ASP.NET default error page in case of each error. To handle it in better way, use custom errors mode RemoteOnly and have a common error page which gets displayed in case of error. Here we are displaying our own error page in case of an error. SQL injection is a well-known security vulnerability, but it is still not handled properly in many applications. SQL injection allows hackers to tamper with existing data, modify transactions, or even delete data or databases, which can be a major loss to business. This will always return items and allow users to get into the application. Click-Jacking is another major vulnerability that gets ignored normally. In this, the attacker uses an opaque layer to trick the user to click on a button or link on different page (say transfer button on the bank website) while they are intended to click on the top level page. It will add the header in all the responses send by the application. 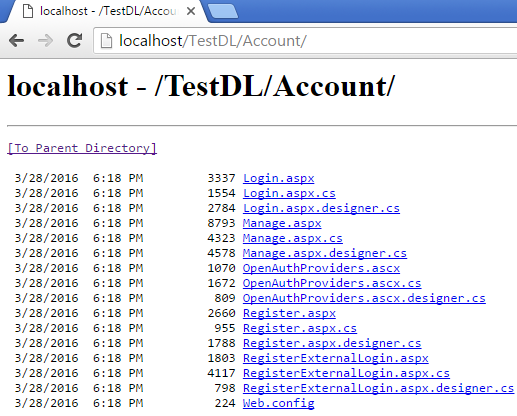 We can also use IIS to add the same header. In IIS, go to the intended website, and go to HTTP Headers tab and add a custom header with the header X-FRAME-OPTIONS as discussed. You will need to restart IIS to get it into effect. It shows all the files and folders available under Account. This information can be a potential threat to the application if publically available. It returns 403 (forbidden), but that still leaves some vulnerability as it tells the user that this folder is available. When we try to access a directory which is not available, it returns 404. For this, we can write our own custom http handler and configure it so that it always return 404 whenever anybody try to access a folder. Many times we put critical information in the Web.config, most commonly the connection string. Similarly we can encrypts other section like <appsettings> etc. Cookies are small text stored by browsers on users’ machines that travel between the web server and browser. Cookies are used to store the user related information for the specific website. In ASP.NET, Session Id is one of the most common pieces of information for which cookies are used to save. Set the cookies as HTTPOnly. This makes sure that cookies cannot be read by client side script so our session or Form authentication token could not read on a browser. View State is one of the most common techniques used to maintain the state between the Page PostBacks in ASP.NET Web forms. View State is saved in a hidden variable on the page with ID __VIEWSTATE. When we see that in view source, we find that it contains a series of numbers and characters. Be sure that it is not encrypted but in base64 format. Anybody can decode it to read the information. There are two options to encrypt and make it tamper proof. There is the property ViewStateEncryptionMode, which can be set at page level in the aspx file or can be set it in Web.config which applies to all the pages in the application. It encrypts the view state before putting it into the response. Similarly, another property, EnableViewStateMac, can be set as true at the page or in Web.config. It creates a hash of the view state content and added in the hidden field. In the next post back, again the hash gets created and verified. If it does not match, then post back is rejected and an error is thrown. Let's imagine an ASP.NET response header that reveals too much information to the end user which they don’t require, like an IIS version, site built on, and ASP.NET version. If an attacker knows the loopholes of any of those, he or she can exploit the vulnerability. This information is by default added, and we should remove it unless and until specifically required. In this post, we discussed that security is key for any web application, and if not handled properly, it can harm the business significantly. We discussed nine of the most common vulnerabilities of ASP.NET web applications and saw that most of these can be fixed by making some configuration change or minor code changes.